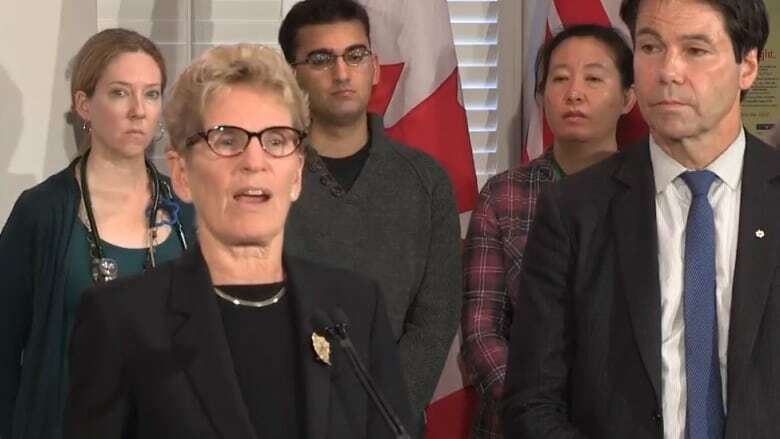 Ontario Premier Kathleen Wynne announced $4.1 million to help community health care service providers repair and upgrade their facilities at 70 sites across the province. Ontario Premier Kathleen Wynne announced $4.1 million on Monday to help community health-care service providers repair and upgrade their facilities at 70 sites across the province. The new money, which will be made available through Ontario's community infrastructure renewal fund, will help 59 health care providers or agencies in all in 2016-17. Wynne, with Health Minister Eric Hoskins at her side, made the announcement at the South Riverdale Community Health Centre in Toronto. "Improving care is about the experience that patients have. So it's also about the environment where we go to receive that care. It's important to keep the buildings that house community health service providers in the best possible condition," Wynne said. "These kinds of improvements don't get the attention of a new wing or a new emergency room. We get that. But they are necessary. They have a direct impact on the safety and comfort of patients and of the people who work here." Wynne said the money will be used to pay for a variety of infrastructure projects, including extending the life of facilities, improving accessibility and enhancing quality of care. Projects may include upgrades and replacements to roofs, windows, heating, ventilation and air conditioning systems and fire alarms. The premier said the throne speech made it clear that one of the province's four basic health-care priorities is "building care up in the community" and the funding flows from that priority. According to a statement, the premier said the money is the first round of the funding through the renewal fund. South Riverdale Community Health Centre, one of the health providers, will receive $265,000 this year through the fund for upgrades to its heating, ventilation and air conditioning systems, and to make washrooms and facilities wheelchair accessible. "It's a good thing," Wynne said. Hoskins said the money will help to ensure that facilities are in good working order. "This is about keeping the lights on and making sure that you have a facility that can truly serve patients and clients and staff," he said. Ontario's health ministry funds community health service providers, which provide a range of community programs, including primary care, community mental health and addictions and residential treatment programs.